"We can’t always get the best of all worlds, but this time we managed: this is a canny method of weaving that gives you the breathability of 100% cotton and the extra movement of stretch. Plus, it’s a failsafe, timeless Oxford fabric that’s utterly non-iron. I can’t think of anything else you may wish for, but, if you can, we’ll work on it. Don’t we always?" "Non-iron classic Oxford shirt made from 100% cotton with a natural stretch for perfect fit, free movement and comfort." Our cutaway collar is wider than the classic collar. 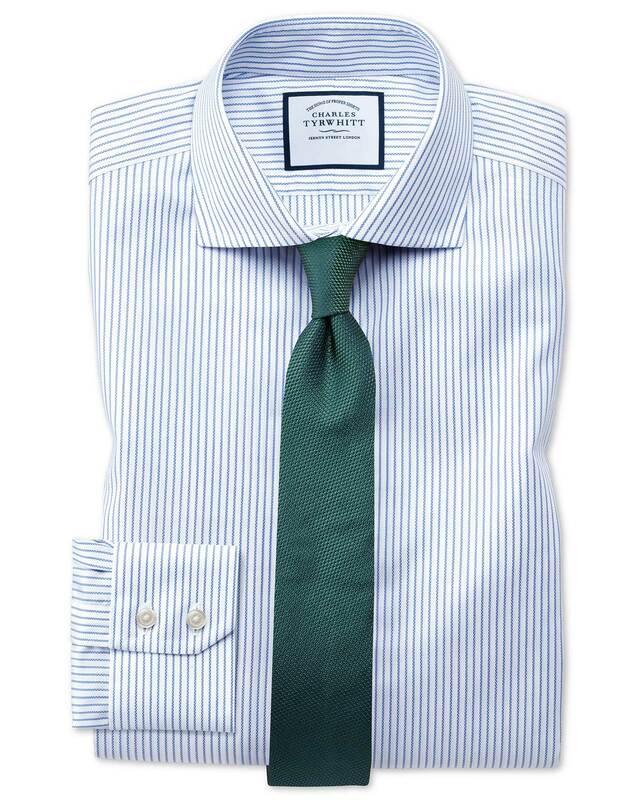 The tips of each side of the collar point outwards (not down) so more of your tie is visible. This collar can be worn with or without a tie; however it looks best with larger tie knots such as the half or full Windsor knot. A special, intricate weave makes this 100% cotton fabric stretch, giving the wearer an extra layer of movement and a whole lot more comfort. I thought the price is reasonable. Superb fit, very attractive texture, love the brass collar stays! The shirts are true to size and the fabric is very soft and comfortable.